Is it still winter where you are? It’s still winter where I am, though you wouldn’t know it from the lovely weather we’ve been having lately. Nevertheless, winter is still very much here and February is often the coldest month of the year. Maybe you’ve spent a lot of time this winter trying to figure out what to do with your baby? 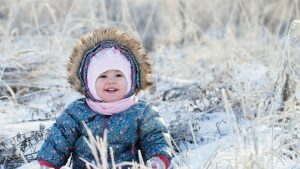 A long cold winter can be challenging, and it can be difficult to come up with fun and unique things to do with a young baby. I’m going to share eight winter activities to do with baby that can be a lot of fun when the weather outside is just too darned cold! Ready? Here we go! 1. Play Places. If you’re a child of the 80s you probably remember a place called Chuck E. Cheese (is that still around?). I shudder at the thought. I’m talking about a much smaller type of play place. One without the arcade, and without the teenager walking around in a giant rat costume. Play places on a smaller scale usually have a climbing gym area for the toddlers and preschoolers, and a baby toy area for the under 18 month set. Babies under 12 months old often get in free, and parents are always free. If you’re lucky, you’ll find one that actually makes a decent cup of coffee too! I’ll admit that these places can be busy (and LOUD), but I have a little secret to share with you. Play places clear out at toddler nap time. By 1 pm, the play place is blissfully quiet. It’s the perfect time to meet up with some mom friends with younger babies, settle into the baby play zone with a nice latte, and chill (or warm up if it’s blustery and cold out). Not only will it be toddler free (in all likelihood), but it’s probably also 100% free to go. 2. Swimming. The swimming pool is a great place to go in the winter! Do everyone a favour and try to find a local pool that’s nice and warm. Many pools have a shallow toddler wading pool, or a family drop in time during the week. These drop ins are usually quite affordable, so if baby isn’t having a good time you won’t feel like you need to get your money’s worth. If you prefer a little more structure, swimming lessons for babies start around 4 months old (or whenever baby has good head control). I’m one for a scheduled class as it really forces us out of the house no matter what. If cost is a factor or you’re just not sure baby is going to enjoy it, try going to a drop in swim first. 3. Bookstores. I know what you’re thinking, but bear with me here. Did you know that some bookstores (I’m looking at you Chapters/Indigo) have a train table in the kids book area? It’s true. You can even find bookstores with coffee shops inside or right next door. Grab yourself a warm beverage, and meet a friend at the train table in the bookstore. 4. Library Programs. Most public libraries run FREE programming for babies, toddlers, and preschoolers. Right now, I’m in a Baby Rhyme Time class with Petit Prince and it’s great! Not only do I get to meet a whole new group of moms and babies, but I also learn new rhymes, songs, and tickles to do with baby at home. Sometimes getting a spot in one of those programs can be a challenge (pro tip: be logged in and ready with yours and baby’s library card numbers the moment registration opens), but if you end up on the wait list check for drop in story times. The libraries in my city all have at least one drop in time each week for babies of different ages. These are totally free and you don’t need to register. 5. Ice Skating. I personally haven’t been on skates in well over a decade (maybe even two), so this one isn’t at the top of my list, but if you can skate you can take the baby! Some rinks allow you to bring your stroller on the ice, and others let you bring a sled on the ice. Either way, you can bring that baby skating with you if that’s one of your favourite winter activities! 6. Science Centre. Is there a science centre in your city? There’s one here in Calgary called Telus Spark. It has a great outdoor playground that’s open year round, and there are lots of indoor activities for toddlers and preschoolers. If your baby is still pretty young, they have a gated off area with fun interactive installations for parents to explore with their babies. I’ll admit that we didn’t have an annual pass to the science centre until The Heir was three years old, but now that we have it we go fairly often. It’s perfect for those super cold days when you’ve been cooped up in the house for too many days in a row. Just don’t forget a change of clothes for the toddler/preschooler (there’s a HUGE water table). 7. The Zoo. Yes, it’s winter and yes, the zoo is outdoors. You know what? The Heir doesn’t care one bit! The zoo is a great way to get some fresh air and get out for a walk with the kids. You’re probably not going to be at the zoo when it’s below say -10C (that’s 14F), but anything warmer than that is fair game! Bundle yourself and the kids up, and spend a little time enjoying the animals. If you get too cold, you can always stop into the rainforest or savannah buildings where it’s bound to be nice and warm (if not a little bit humid). I’d recommend getting an annual pass for the zoo (here, kids under 3 years old get in free). This way you can go as often as you like all year round, and you won’t feel the least bit guilty about leaving after only an hour if everyone is too cold. 8. Walking. Just getting outside once in a while is a great way to get a little exercise and fresh air in the winter. If you’re worried about slipping on the ice, get some crampons (clip on spikes) for your winter boots. These will give you great grip on the ice! 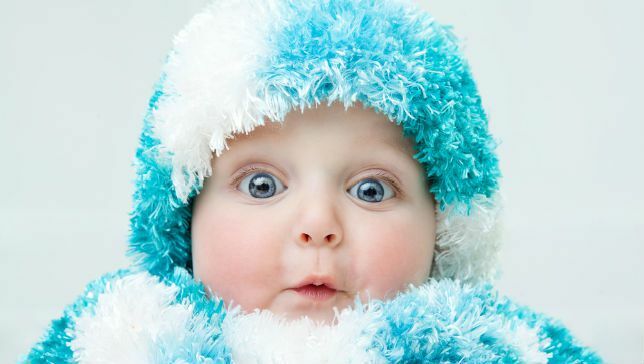 Don’t be afraid of wearing your baby in a carrier outside in the winter or bundling baby up in the stroller. Moms in Sweden do it all the time. My friend Lindsay over at Maman Loup’s Den has an excellent round up post of ways to stay warm while baby wearing, so if you want to keep wearing that baby through the winter you should check it out. I realize that not every city or town will have all of the above activities available, but hopefully you can find one or two options where you live! Once you’ve met a few mom friends, you can also pick their brains for the activities they enjoy throughout the winter in your city. The most important thing is to not become too house bound! I know it’s cold, but hauling everyone out at least once a week can make the winter go by just a little faster.